If you are a student you can feel the pain of wasting a complete year in your studies life. And when if you are either not responsible of that failure, it will hurts alot more. 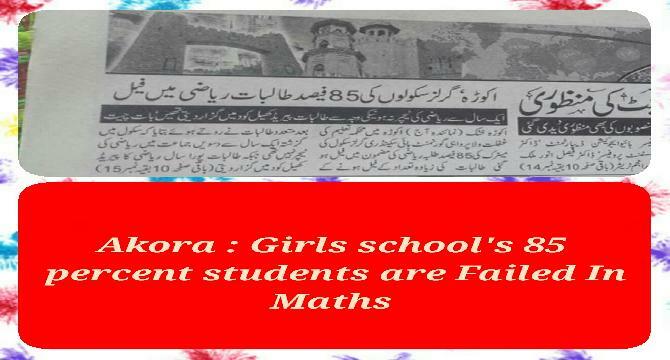 Yes it's true almost 85 percent of girls are failed in the subject of Mathematics in a high school in Akora. Normally girls are more keen in studies than boys and they failed at very rare occasions. But here it's not their fault because in 10th class there was no teacher available to them for the maths subject and girls takes it as a games period.Those girls were crying while saying this. Now the questions are ! Who is responsible for their one year lost and their failure? What for our ministry of education is ? What are they being paid for? And who will ask them ? Sadly no one will answer these questions. I request all the students on behalf of chillkey.com that get up and make your voice loud for your rights. And will request ministry of education to monitor these things seriously to avoid such things in future. The girls are responsible for this failure. Why did not they consult their headmaster or other concerned authorities? It was the duty of their parents to do something in this connection.